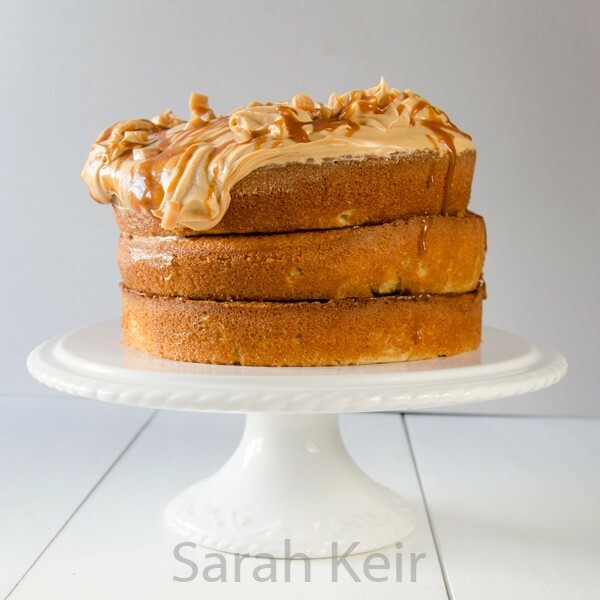 Salted caramel seems to be everywhere at the moment; in cakes, ice-creams and chocolates. But it is not new; it is a rediscovered classic. And for good reason; it tastes fabulous! Salt is underused in sweet cooking but it actually enhances a lot of recipes, not just savoury ones. Just try making some melted chocolate discs topped with sea salt to see what I mean. Salt really makes the favours sing and brings out more sweetness without having to over-do the sugar. There are many types of salt which also affect how it combines with the recipe and many also have subtle flavours of their own due to trace minerals. My favourite salt is sea salt; I grind a little into dishes as I cook them and often add a burst of coarse flakes at the end. What is your favourite type of salt? 1. Preheat the oven to 180°C/160°C fan. Grease and line three 8″/20cm round sandwich tins. 2. Cream together the butter and sugar until light. Beat in the eggs one at a time, adding some flour if it looks like it is curdling. In a jug mix the cream/milk and vanilla and in a large bowl mix together the remaining dry ingredients. While mixing the creamed butter and sugar, alternate adding the wet ingredients and dry ingredients. Give everything one final mix by hand and then divide between the three tins. 3. Bake the cakes on the same shelf in the oven until a toothpick comes out clean; about 30 minutes. All to cool completely in the tins. 4. 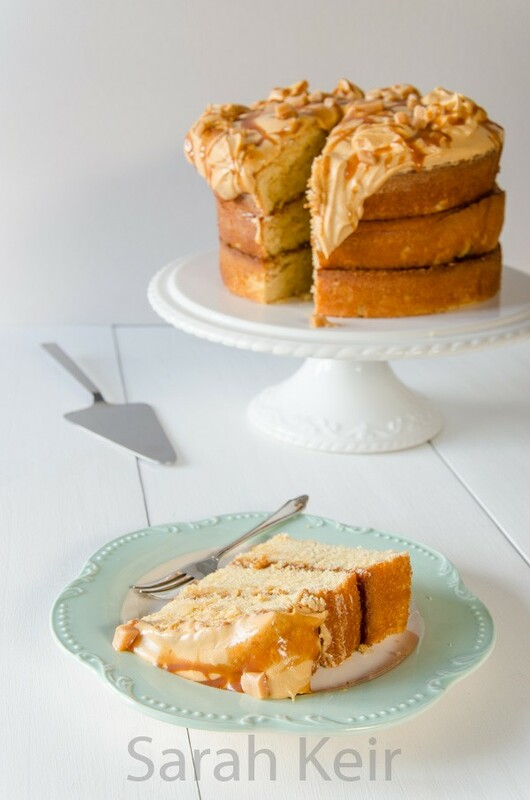 Make a batch of Swiss meringue buttercream (recipe here)(about a half batch is plenty for layering and icing this cake) and flavour with about half a tin (200g) of caramel. 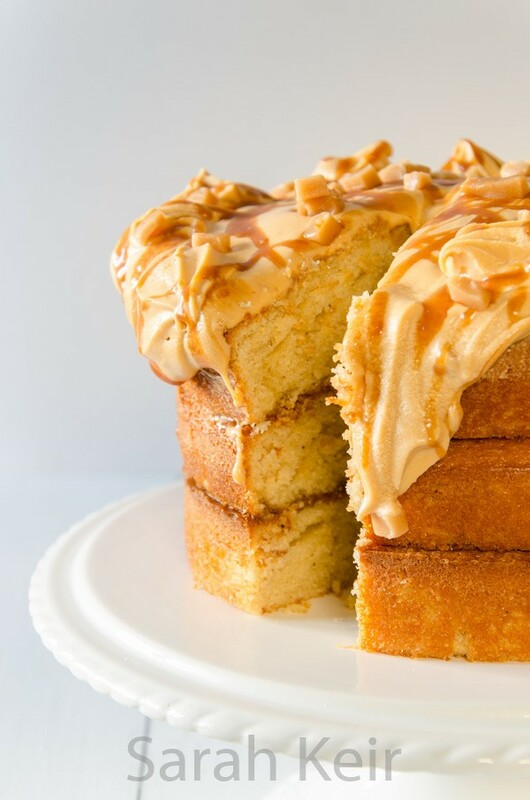 Pipe or spread over the cake, drizzle over some more caramel and scatter with fudge pieces.